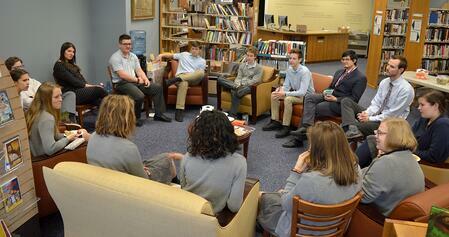 Upper School students prepare to engage the world for Christ. They read the Great Books of Western civilization and take rigorous courses in science, math, ancient and modern languages, Bible and fine arts. Leadership and service opportunities allow them to live out the values they embrace. 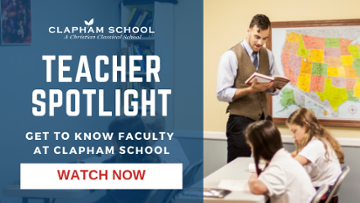 In Clapham School’s Upper School, we seek to equip, guide, and shepherd high school students to pursue wisdom in community as followers of Jesus Christ. Inspired by the classical tradition, we equip students with the fundamental skills of learning, known as the liberal arts, in order to develop them to be learned, critical and articulate thinkers. Moreover, we guide students with intentionality, forming their affections to love what is true, good, and beautiful. Finally, we shepherd students to be wise and virtuous human beings who will serve Jesus Christ throughout their lives. What does this look like practically? To examine our classical approach to education closer, consider five key features of the Upper School that illustrate our unique program. While most modern high schools default to lectures from the instructor, students at Clapham participate in active learning through rich and stimulating discussion led by dynamic teachers. 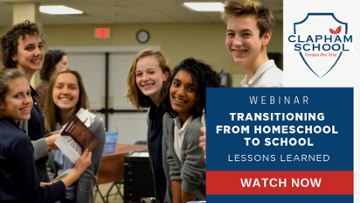 This method of learning has proven to engage all students and hone skills of critical thinking, thoughtful listening, and articulate speaking. At Clapham, students are given the unique opportunity to read the timeless classics that serve as the bedrock for western civilization. From Dante Alighieri to William Shakespeare to Frederick Douglass, students wrestle with the prominent ideas and figures that promise to form their readers intellectually, virtuously, and spiritually. All students at Clapham are viewed as developing leaders who will go on to impact society through their influence at work, relationships with family, and involvement in the community. Through Clapham’s Student Leadership Council we train every student in the leadership skills of perseverance, responsibility, organization, teamwork, public speaking, and more. While many high schools today pride themselves on their large size and crowded classrooms, we believe the highest quality of learning occurs when students who know each other well gather in a small classroom setting. Through semester retreats, annual trips, service projects, and game nights, edifying friendships develop in the Upper School and a tight knit community of students that pursue wisdom together is the result. Teachers at Clapham care deeply about their students and desire above all to see them grow in wisdom and love for Jesus Christ. In contrast to a contemporary culture that seeks to maintain a wall of division between high school students and wiser adults, Clapham is committed to cultivating mentor relationships between teacher and student through small class sizes and an intentional mentoring program. See our Upper School Graduation Requirements Jan 2019 for an overview of our course sequence.